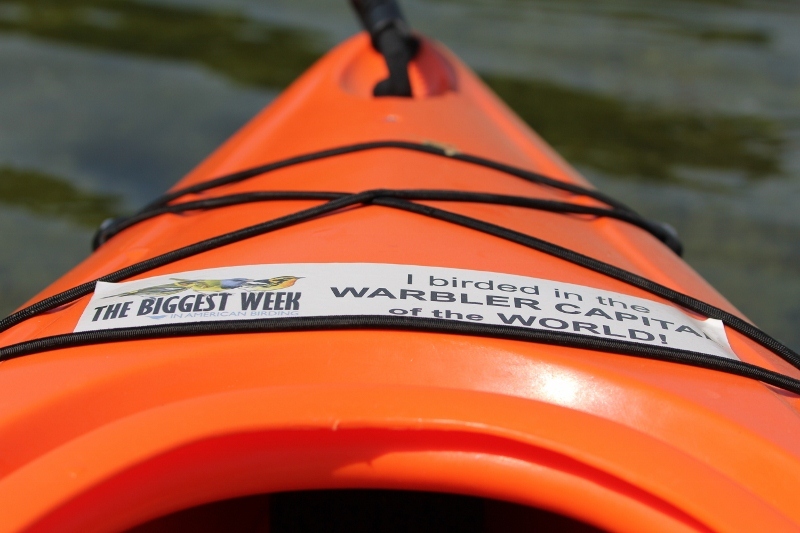 Even my kayak has a birding bumper sticker! We finally got our kayaks in the water this weekend, and it was looong overdue. This spring has been so full of birding and travel that we had let our beloved kayaks sit neglected in the garage. When I realized last week that it was almost July and we hadn’t been on the water yet, that was all the motivation I needed to plan an immediate outing. We knew the day was going to be very hot, so we headed out as early as we could manage; we were on the water at Trout Lake by 9:30. Luckily the water at the boat launch was much clearer this time. And there was nobody at the beach either, so it was nice and quiet. Well, except for the constant rifle shots from the nearby shooting range…sigh. I’ve noticed a theme in Michigan state and county parks: Wherever there’s a nice nature area, there seems to be a shooting range nearby. I think there should be a law that shooting ranges have to be indoors so they don’t disturb the peace. I don’t see why they have to be open-air shooting ranges, do you? But I digress…. There was one other couple launching kayaks right behind us, but aside from them there was only one other boat on the lake. Very nice. 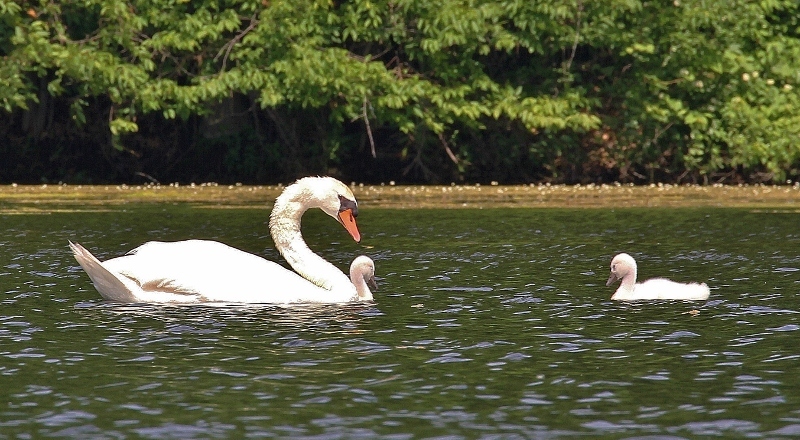 As we started to paddle out, I immediately saw the resident pair of Mute Swans with their two adorable cygnets. We gave them a wide berth and headed to the far shore. Mute Swan with cygnets. The other parent is just out of the photo frame. Yes, that’s one of those horrible mylar balloons floating in the water. Just in case you don’t know about the dangers of these balloons, you might want to take a look at BalloonsBlow, an organization dedicated to making people aware of the harm these balloons do to the environment and to wildlife. I’ve seen some very sad photos of birds and other animals who died after getting tangled up in the ribbons or after eating pieces of the balloons. It just shouldn’t happen. I doubt that anyone who’s aware of this issue would plan a balloon release, no matter what the occasion. There are always environmentally-friendly options for celebrations that don’t involve litter and unnecessary death; you just have to care. So I made haste to the waste and grabbed that balloon out of the water, stashing it behind my seat for disposal at shore. And not 10 feet away I saw a fishing lure dangling from a tree snag (you can actually see it in the photo above). I started to wonder if my entire morning would be devoted to picking trash from the lake instead of birding and enjoying nature. So I untangled the fishing line and stashed it behind my seat too. By this time Eric had continued on exploring the lake, no doubt wondering what the heck I was doing back in that little cove. I caught up with him and he had just spotted an Eastern Kingbird sitting on its nest overhanging the water. My photos didn’t turn out, but he got some good ones with his new Canon SX50 — this is his pic. What an amazing thing to see! I wonder about the survival possibilities for any eggs laid in a nest exposed to the hot sun like that; it doesn’t seem the best place to build a nest. I hope they manage to fledge some babies there. I always feel so privileged to get such an intimate glimpse into a bird’s life that it’s hard to restrain myself from getting too close or staying too long. 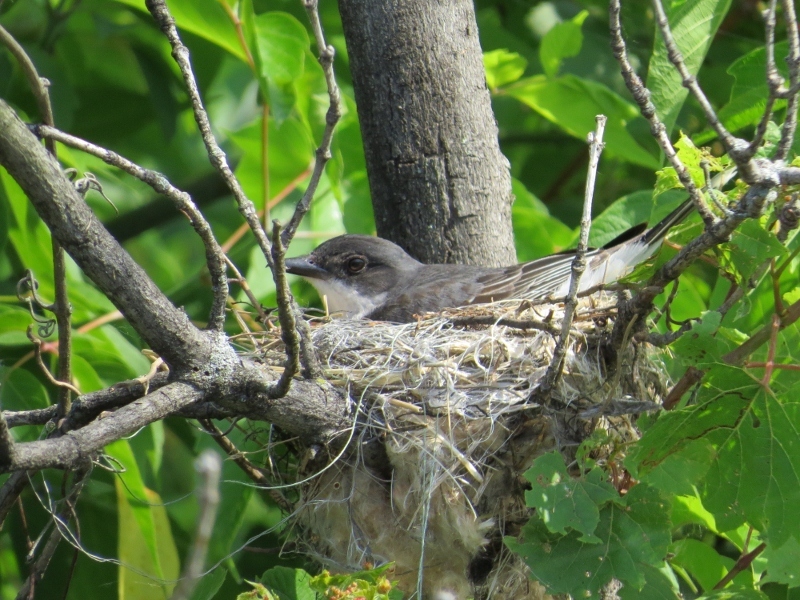 But I forced myself to move along after less than 30 seconds, afraid that I might scare her off the nest. The beach started to see some activity around 10:30 or so, but it still wasn’t too noisy. We paddled the full perimeter of the lake and saw more great birds: more kingbirds, some Baltimore Orioles, Blue-Gray Gnatcatchers, a gorgeous Red-tailed Hawk, a Gray Catbird singing boisterously, and even an Eastern Bluebird. 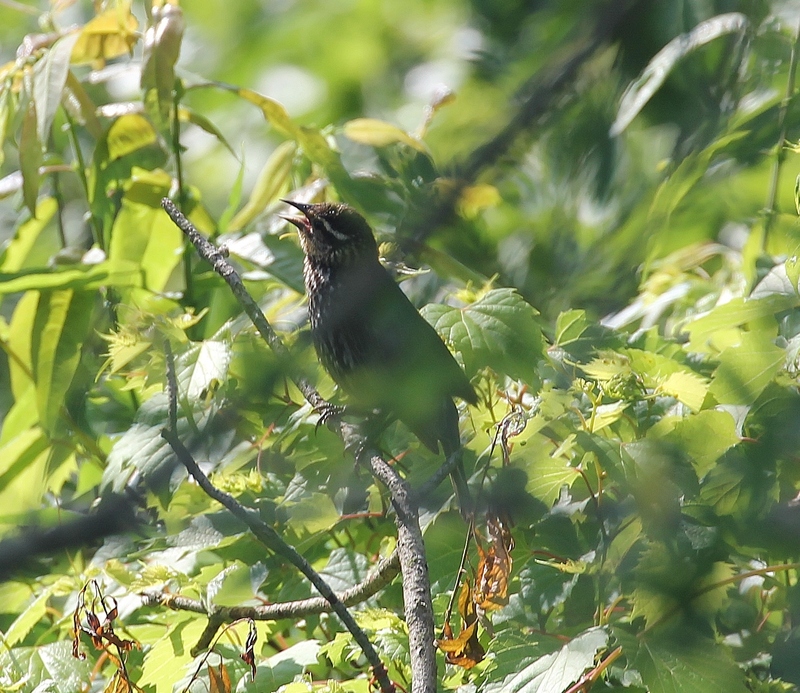 I also watched a male Red-winged Blackbird feeding his recently-fledged young in the grass along the shore. I couldn’t get a photo of that but did manage to shoot a pic of the second youngster waiting up in the trees. We headed for shore around 11:30 as it started to get uncomfortably hot out on the lake. We got another look at the cygnets as we passed, but didn’t dare get too close to those ferocious swan parents. 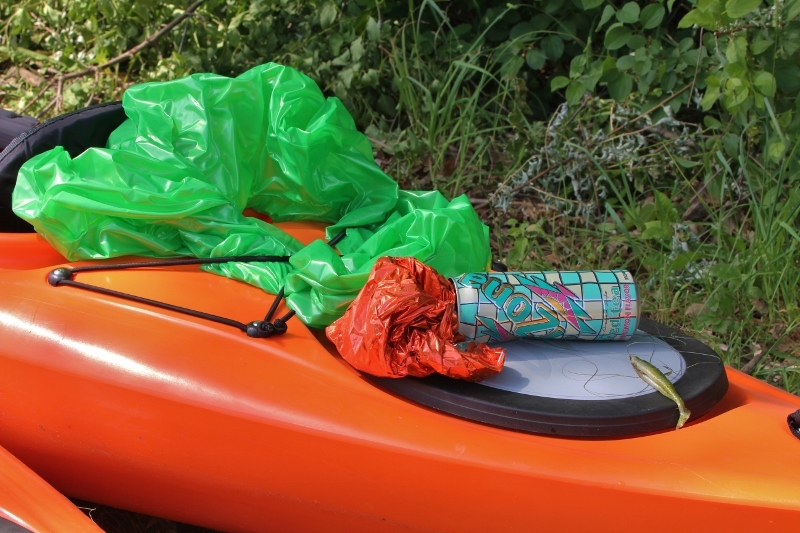 This is a photo of all the trash I collected from the lake: the orange mylar balloon, the fishing lure, a green inner tube floating toy, and a soda can. As sad as it was to see all this junk in the water, it felt really good to pull it all out of there. Next time maybe I’ll leave the binoculars at home and just take a trash bag…. Admin note about leaving comments: A few people have told me that they have trouble finding where to leave a comment on my posts. Let me help you out: Look at the end of every post, beneath the sharing buttons and tags. You’ll see a link there for “comments” — click that. And I’ve added a “contact me” form in the menu bar at the top of the blog too, so you can always use that to send me a note. I love hearing from you, so please don’t hesitate to send me any questions or comments you have. This entry was posted in Birds, Kayaking and tagged birding while kayaking, birds, littering, Michigan outdoors, nature, pollution, wildlife. Bookmark the permalink. Thanks for the reminder, Rob. We’ve been meaning to put our kayaks in at Graham Lake. Will try to get out there soon! I agree with Kim, inflatable kayaks can be a great way of assessing whether kayaking is for you. When you are looking for bird hideouts it is a great way to sneak up on them and easily lauch your kayak without any hassles. I’m impressed with how close you get to birds. The garbage in sometimes overwhelming, isn’t it? I try and do what I can too, but it is difficult. 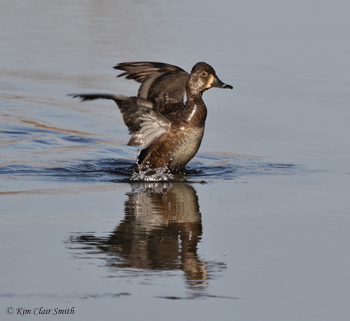 We’ve found that kayaks are the best way to sneak up on birds. If only we could be that stealthy while walking in the woods…. I love the swans and the babies! I love that you cleaned up the trash that you did, especially the mylar balloon and the fishing lure. I am always saddened to see things like that in the wild because they endanger wildlife and birds. Great post Kim! FD and I pick up trash wherever we might be as well. In our own woodlands, we often find discarded trash and objects that the wind blows in. Mylar balloons, plastic WalMart sacks, and those horrible Styrofoam cups make up most of the “town” trash. Out near the river (about a mile away) flooding brings all sorts of trash. We pick up what we can. 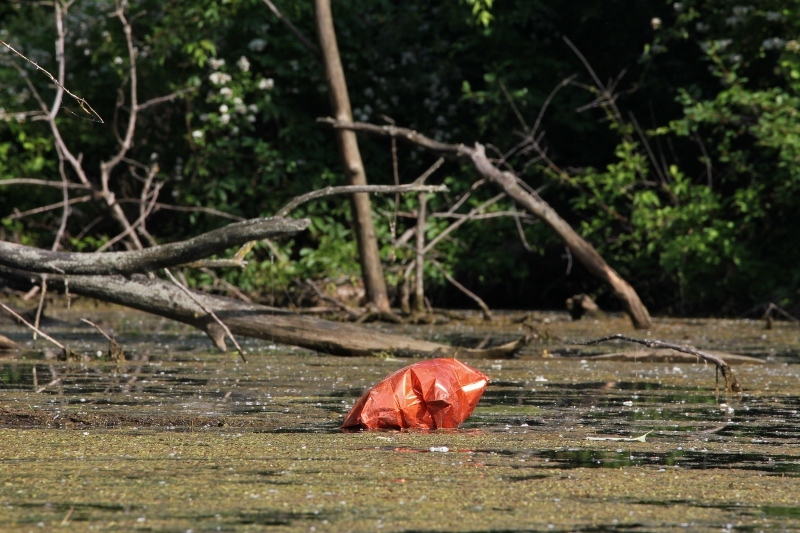 It’s amazing what floats around loose… what humans discard of with no apparent caring for the environment. You’re right, it’s amazing how much trash is just blowing around out there. I know some of it gets away from people accidentally, but apparently lots of people still think it’s ok to toss their junk anywhere they like. Makes me sad. The timing of your post is interesting. Now that we are moving to Cultus Lake I am finally going to buy a kayak. I have been wanting to get one for a long time. What brand/size/kind of kayaks do you have? And did you test different kayaks before making a purchase, or just go for it and buy them without testing them first? In my case I will be going alone, so I have to get one that is light enough for me to lift on top of my Tucson by myself. That’s great, Kristie! You’ll have so much fun out on the water. We have the Manatee kayaks from LL Bean (http://www.llbean.com/llb/shop/54367?feat=1103-CL2&page=manatee-deluxe-kayak-package). They’re very comfortable and stable. They weigh 40 lbs, which is technically not that heavy, but the size makes it too hard for me to lift up onto the car. Eric always does the loading, using a small stepladder. Your car is probably the same height as our Chevy Equinox, so it might be tough to do by yourself. If I had to do it over again, I think I’d look into those inflatable kayaks…some of them seem very well made and easy to inflate. But there might also be lighter-weight solid kayaks too. I guess you’ll have to do a bit of research. And we got lucky with our mail order method, but it’s probably smarter to go to a store where you can sit in them first. Whatever you choose, your first time floating on a quiet lake will be heaven!